Sympatex - Product and Technology - Your partner for innovative functional textiles. Lovers of the great outdoors have high demands for their clothing and shoes. They must keep their bodies dry whilst controlling the body temperature perfectly in all weather and regardless of activity level. There is nothing more unpleasant than wet and cold clothing. As leading provider of sustainable functional textiles, Sympatex has therefore developed a special membrane which is 100 percent waterproof, 100 percent windproof and optimally breathable – like a second skin. The membrane absorbs the water vapour and removes it through the clothing to the outside. And the best thing about it is: The Sympatex membranes “breathes” dynamically which means the higher the physical activity, the more efficient it works. Thus, functional textiles with a Sympatex membrane provide effective protection from low temperatures and rain. This keeps the body warm and dry even in extreme situations. 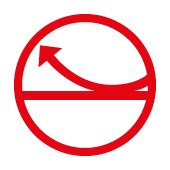 The Sympatex membrane (5 – 25 µm) is connected to a wide range of possible base materials such as woven fabrics, knitwear, fleece, foam or leather to form a laminate for a specific application. The application of tapes tailored to the specific usage of the laminates is what makes the end product (for example a jacket of shoe) into performance functional textiles. Uniform high quality is assured by the interplay between the laminate, tape and technical processing guidelines. This is the only combination that sets a licensed Sympatex product apart from the rest. 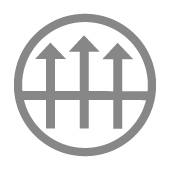 Thus, Sympatex is a global supplier of high-tech functional materials for international brand partners in clothing (Apparel), footwear, protective workwear (Contract & Workwear) and technical applications. Our continuous development in products and technologies enables us to provide our customers with a wide range of laminates to suit their specific needs. Our focus is on protection, comfort, performance and perfect functionality with a special regard to ecological responsibility. In addition to its performance, Sympatex relies in particular on recycled and recyclable materials as well as climate neutrality. When outdoors, we are exposed to the prevailing weather conditions. Functional textiles which feature the 100% waterproof Sympatex membrane provide excellent performance and make for more outdoor enjoyment. 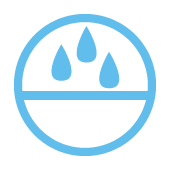 The waterproofness of the membrane is measured on the basis of the water column under the pressure of which the material starts to allow water through it. According to EN 343, a membrane is waterproof if it can resist a pressure of 1,300 mm. 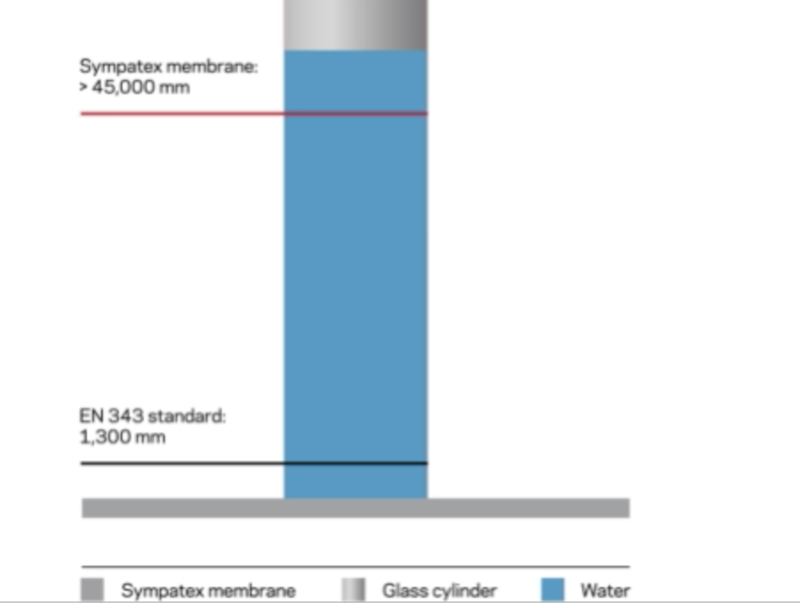 Pursuant to ISO 811, the Sympatex membrane far exceeds these values and is extremely waterproof with a water column of over 45,000 mm. Breathable clothing which removes perspiration in the form of water vapour from the skin supports a pleasant body climate and prevents overheating. In contrast to other membrane technologies, the poreless compact Sympatex membrane is based on a physical and chemical principle. The water-attracting (hydrophilic) part of the membrane absorbs the moisture from the body and emits it to the outside by evaporation. 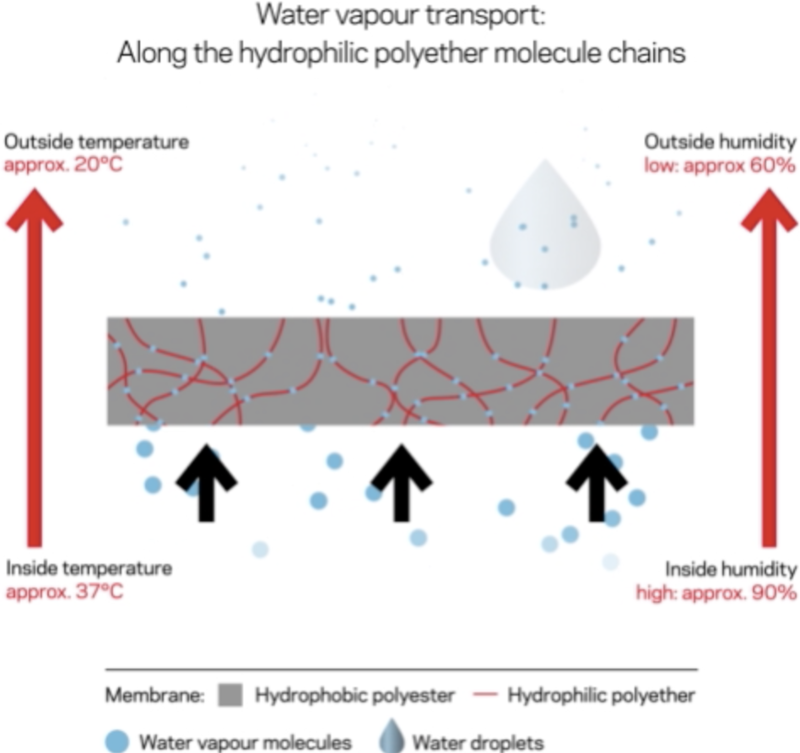 The water vapour molecules are transported outwards along the hydrophilic molecular chains. The molecular structure (hydrophilic components) of the Sympatex membrane swells in moisture and therefore provides space for water vapour transport and fast evaporation. This effect increases as the difference in temperature and moisture rises. A partial pressure gradient, which results from different temperature and humidity inside and outside, is the driving force for the water vapour transport through the membrane. The Sympatex membrane is 100% windproof, pursuant to DIN EN ISO 9237. This functional property is important to avoid the wind chill effect, the subjective feeling of feeling cold in the wind. The wind removes the warming layer of air from around the body. The perceived tem­perature is lower than the actual temperature. 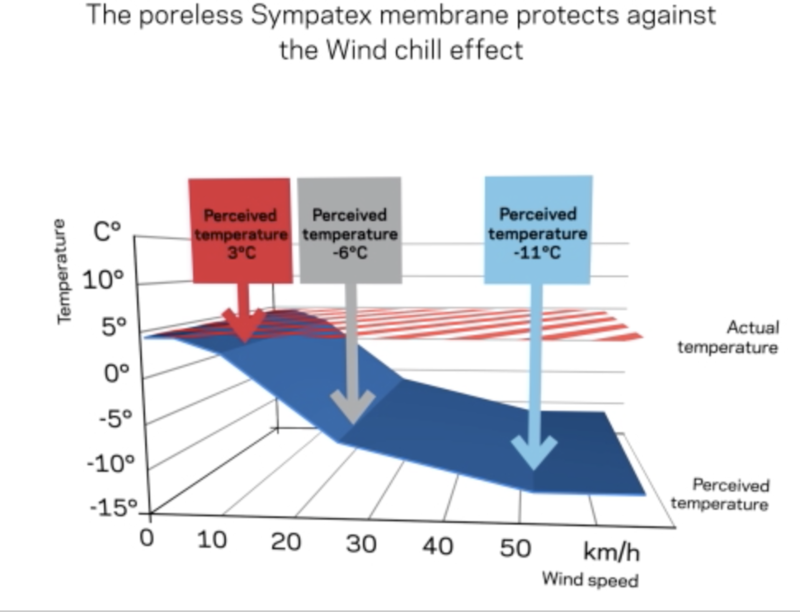 No wind chill effect with Sympatex membrane: 0 litres of air per second pass through 1 m² of Sympatex membrane. This means that according to DIN EN ISO 9237, the Sympatex membrane is absolutely windproof and prevents any drop in performance.